Time-lapse photography is a concept of taking snapshots at a particular interval over time to record events in a low resource manner, compared to capturing a video stream. Here, we discuss how to use a relatively inexpensive web camera and a computer to build a low-budget time-lapse platform. Pretty much any relatively modern PC with decent storage and functional USB 2.0 ports should suffice. I had an old big-box special on hand. The Logitech C615 is the model featured. It does 1080p capture, with some nudging. *Even though I held up an external HDD in the footage, I didn’t get to show setting that up yet and instead relying on internal storage for now. 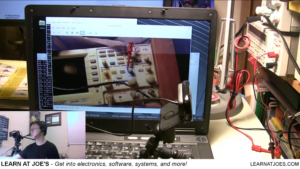 It is a bit of trial-and-error figuring the optimal parameters for the fswebcam utility with a camera. Hope you found this useful and informative. Having a setup like this opens up a lot of other potential applications to build upon. Disclaimer: from a technical and functional perspective, this post is about using extending usage of commodity hardware using computer scripting. There are some potential premise security applications for such a setup. While anyone is welcome to use the information herein, the reader is responsible for determine appropriate for use, deployment, and maintenance of such applications for their security needs. I/We do not explicitly endorse this type of setup as a part of a security protocol.